We recently reported on increased sign up bonuses on two of the Delta Skymiles Personal credit cards from American Express. 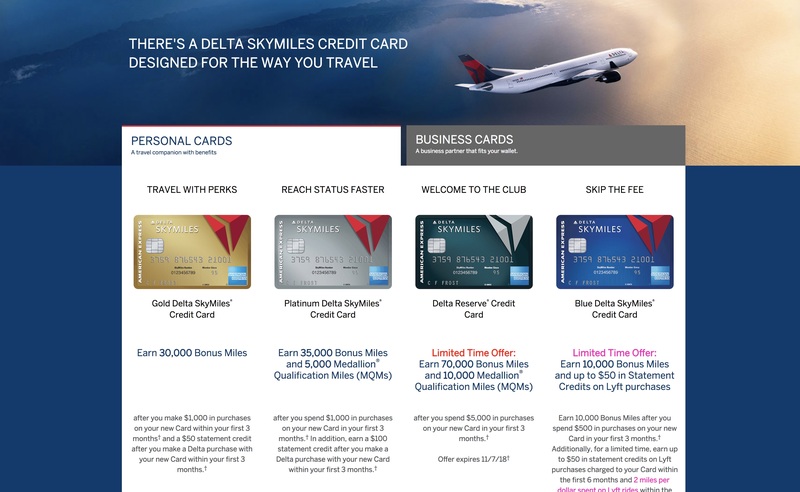 These bonuses ended on September 19th, but now it seems there is a new batch of increased bonus offers for the Delta Skymiles Reserve card, Blue card and for two of the Delta business cards. 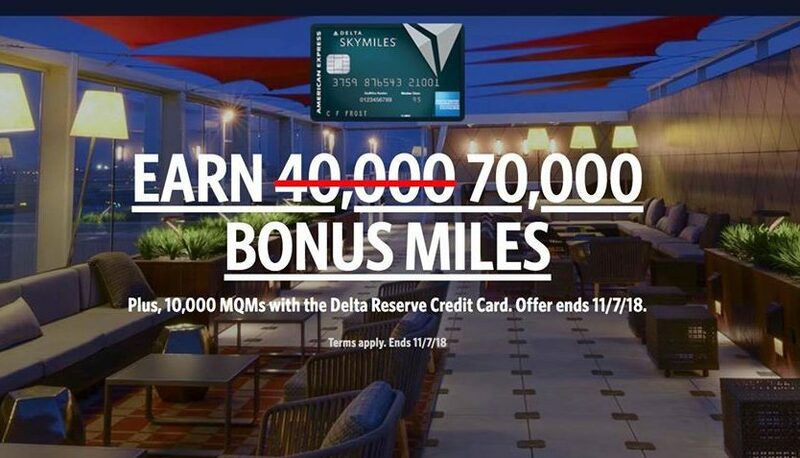 The Delta Reserve sign up bonus has increased from 40k Skymiles to 70k and offers 10k MQMs. The Reserve card is the most elite of the personal cards and comes with a $450 annual fee. Benefits include complimentary Sky Club access, an annual companion ticket valid for first class travel, as well as a wide range of travel insurances, free checked bags and of course 2x per dollar on Delta flights. This is a limited time offer and ends on 11/7/2018. To get access to the offer you have to go through Delta’s website, the American Express website still shows a 40k sign up bonus. 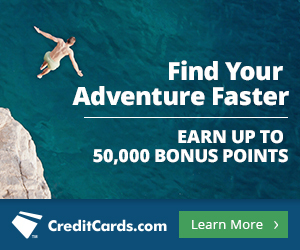 The American Express website still shows a 40k sign up bonus. In addition, the Delta blue personal card, which is the lower tier, no annual fee option, now has a 10k sign up bonus, plus $50 worth of statement credits for Lyft rides for 6 months and also earns 2 miles per dollar on Lyft spending in the first 6 months. You will have to be quicker if you want to take advantage of that offer though, it will end on 10/18/2018. In addition to personal cards, the business versions of the Platinum and Reserve cards are offering increased sign up bonuses, the Platinum at 50k and the Reserve matching the personal version at 70k. The business Platinum card has a $195 annual fee and the business Reserve is the same as the personal at $450. These offers for the business cards will also end on 11/7/2018 and can only be accessed through Delta’s website which links to an Amex website landing page that has all the offers for both business and personal cards. You can access all the offers here. Thanks to Credit Shifu viewer Anthony Gardner for alerting us to these offers.